The Iowa Flood Center’s stream monitoring network is gaining interest across the country. Through a partnership with Riverside Technology Inc., the Iowa Flood Center received funding and support to deploy a stream stage sensor on the Poudre River in Colorado. The sensor has been deployed as part of a pilot project to improve flood awareness and prediction capabilities. Read the full story by the Coloradoan, here. The Iowa Flood Center (IFC) is partnering with the South Central Iowa Cedar Creek Watershed Management Authority (WMA) on a project funded by the Farm Bureau and other local stakeholders to advance the flood reduction goals of the WMA. The IFC recently deployed a new stream-stage sensor near Lovilia and will develop a hydrologic model of the watershed. Daniel Ceynar (left) helped design the IFC stream-stage sensors and also installs and maintains hydro-metrological equipment and other field equipment used for research. Raymond Hammond (right) supports installation of stream-stage sensors and helps maintains 30 local rain gauge stations, while performing other research assistant activities. IFC affiliates Daniel Ceynar and Raymond Hammond installed the sensor. Ceynar, a project engineer, and Hammond, an application programmer and analyst, have been responsible for installing sensors on rivers and streams across Iowa as part of the IFC’s expanding stream-stage sensor network. The IFC-designed ultrasonic sensor measures the height (or stage) of the Cedar Creek every 15 minutes and transmits the readings to a database at the Flood Center. The public can access these readings through the Iowa Flood Information System for real-time stream level updates. The Cedar Creek WMA, which formed in 2015, believes the sensor will help alert residents and farmers to potential flooding threats. Linda Shumate, the Cedar Creek WMA coordinator, was involved in choosing the location of the stream-stage sensor and wanted the location to be near the headwaters of the river. In addition to the stream-stage sensor, the IFC will work with a local volunteer landowner to install a rain gauge station that measures rainfall, wind speed and direction, soil moisture, and soil temperature. Shumate aims to have more rain gauge stations and sensors installed in the watershed in the coming years to benefit residents and particularly local farmers, who played a large role in the founding of the WMA. This is in concert with the IFC’s plans to continue expanding its stream-stage sensor and rain gauge stations, so more communities can have access to flood monitoring and prediction tools on IFIS. There are currently 220 bridge sensors installed across Iowa, of which 150 were DNR-funded, and there are plans for 10 more sites by the end of the year. The IFC will install at least 20 new rain gauge stations this year as part of the statewide Iowa Watershed Approach project, which will add to the existing 40 stations already deployed across the state. Imagine if people felt free to throw their garbage into your home. Imagine how the swan feels in a nest overwhelmed by trash, or the sea turtle who has to swim through a mass of plastic refuse. Now imagine we can do something about it. That’s exactly what IIHR Engineer Dan Ceynar hopes kids will do after they read the new book by Ellen Lawrence, Poisoned Rivers and Lakes. Ceynar served as a consultant on the book, published by Bearport Publishing. Lawrence asked Ceynar, who spends much of his free time on river clean-up events, to fact-check the book when it was still in preliminary form. He was able to provide clarifications on topics such as toxic algae blooms and agricultural pollution. The book is part of a series by Lawrence that includes Dirty Air, Garbage Galore, Global Warming, and Polluted Oceans. Ceynar says he hopes the book will raise awareness about water pollution problems. “It’s very easy not to care about a problem that you don’t know exists,” Ceynar says. He also hopes the book will stimulate conversations between kids and adults. 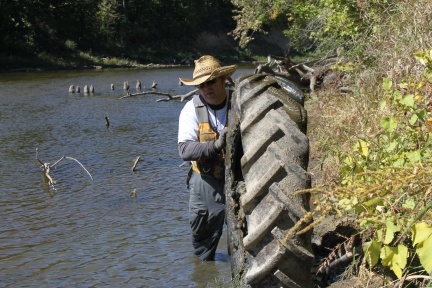 Ceynar even appears in one of the book’s photos himself, piloting a canoe laden with carefully balanced tractor tires, an automobile bench seat, and more, taken at a recent Iowa River clean-up. Ceynar says he declined the consultant fee offered for his work on the book in return for extra copies to donate as door prizes at the river clean-ups he participates in. Poisoned Rivers and Lakes is available from Bearport Publishing. You can also learn more about the river clean-up events Ceynar is involved with: Project AWARE, IARVCP, and LWRCP. Iowa Flood Center Director Witold Krajewski and Engineers Ricardo Mantilla and Dan Ceynar met with the Palo Storm Water Management Committee on August 18, 2009. Palo Meeting on August 18.